The results of these tests using the AWP-24 are now available for download. Below is a short description of the tests performed. The complete test descriptions and test results are included in the download. 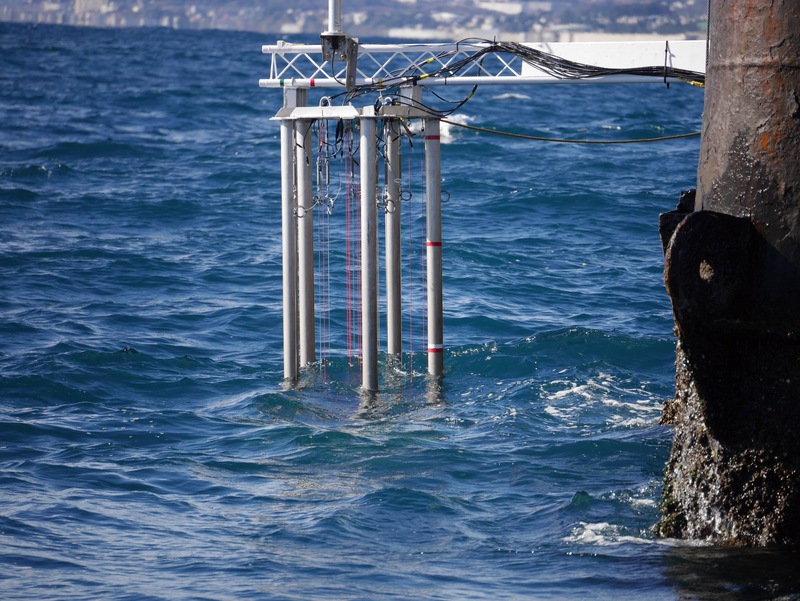 Calibration test: calibration of wave height gauges involves acquiring a data set of output voltages at known water depths and then computing the linear relationship between voltage and depth. By using more than two points, we can look at the error between the calibration points and the best-fit straight line. Background noise test: this test involves obtaining a short data sample and looking at the difference between the minimum and the maximum of the sample as well as the standard deviation of the data. We completed this test on a wave height gauge attached to a short length of instrumentation cable as well as on a wave height gauge attached to 60 m (200 ft) of instrumentation cable. This provides a view of the gauge noise as well as the effect of long distances between the gauge and the data acquisition system on noise. Short-term drift test: this test involves placing a wave height gauge in very still water and acquiring a data sample for a period of 1 hour. If temperature is constant, the measured wave height should be constant over the hour. Long-term drift test: this test involves placing a wave height gauge in very still water and acquiring data for a 72 hour period. Since the temperature of the electronics will vary with room temperature, we expect to see some low frequency drift caused by temperature. Temperature is acquired at the same time as wave height so it is possible to look at the wave height change at the same time as temperature. Interference test: in this test we investigate the interference between adjacent wave height gauges. The test procedure involves placing one gauge in very still water and then raising and lowering a second gauge into the water within 15 cm of the first probe. The change in the output of the stationary probe gives an indication of the amount of interference between the two gauges. 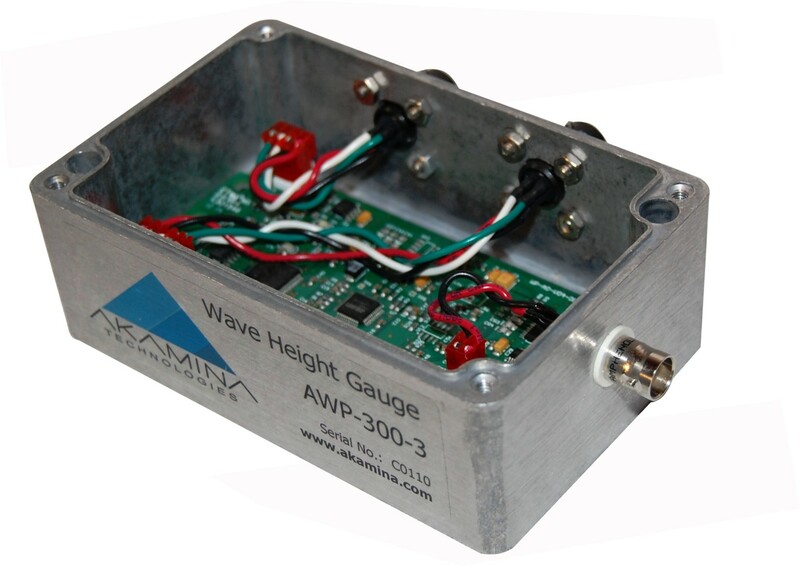 For more information on the Akamina's Wave Height Gauge or to obtain a quotation contact us at: . Akamina supplied a system of 15 waterproof wave height gauges to the Port and Airport Research Institute (PARI) in Tokyo, Japan. The system is used for directional wave measurement on their Hiratsuka Tower (close-up view ). WaveGen-Studio and the ADQ-1000 provide a complete solution for your data acquisition needs. Akamina's system uses a network of connected servers for control capabilities and the acquisition of data which is controlled by WaveGen-Studio. For more information please read more at WaveGen-Studio and ADQ-1000 . Akamina has the exclusive license to GEDAP - Generalized Experiment control and Data Acquisition Package - developed by the National Research Council Canada. GEDAP is a well-proven, complete software solution for physical modelling in hydrodynamic laboratories. GEDAP brings wave synthesis and wave data analysis with sophisticated plotting capabilities to the Akamina data acquisition and control offering. Akamina completed the design, fabrication, installation and commissioning of the new portable wave generator in the Large Area Basin at the National Research Council Canada . This system features a portable, modular design consisting of 9 modules with 8 piston-mode segments per module. The drive system includes a regenerative power supply with an inverter to drive a transmission system that includes a synchronous motor, lead screw and rotating ball-nut. The controller and the servo drives for the 8 segments in a module are connected on a SERCOS III loop. The control system was featured in the "Sercos Makes Waves" article on the Sercos.org website. The wave generator control system provides support for active wave absorption (reflection compensation) for both unidirectional and multidirectional waves. Other enhancements include improvements in sidewall reflection techniques and second-order wave generation. For other news visit Akamina Technologies News. In 2016 Akamina completed the design, fabrication, installation and commissioning of a 48-segment facility for the Offshore Technology Research Corporation at Texas A&M in College Station, Texas, USA. This was an upgrade project in which the mechanical and hydraulic drive subsystems were already in place. The upgrade included the design and fabrication of custom control hardware and software as well as data acquisition hardware and software. Installation, integration, commissioning and training were carried out on-site in College Station. Akamina's WaveGen-Studio with GEDAP software were supplied for wave generation and data analysis. Akamina completes the design and the successful installation of 56-segment wave generator control system upgrade. The upgrade included custom control hardware and software as well as data acquisition hardware and software. This work was done for EDF - Laboratoire National d'Hydraulique et Environnement (EDF-LNHE) in Chatou, France.